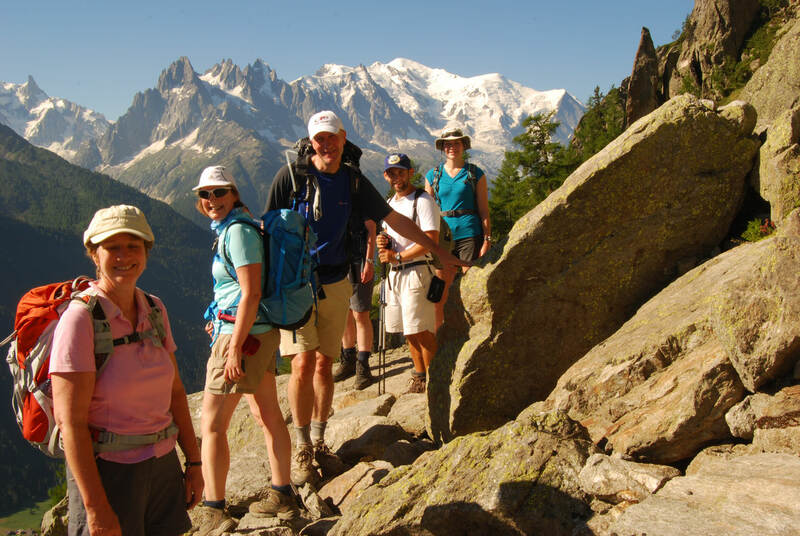 If the Tour du Mont Blanc is your first major trek, then you need to be aware of the daily demands of a long hike. Most fit people can do a walking weekend with two long days, but a multi-day trek is different as you have to keep going for 8-10 days in a row with only one or two rest days en-route. Therefore, stamina is the key thing to concentrate on. In addition, you need to be aware of the demands made on your feet (make sure you have good, well worn-in boots that don’t give you blisters) and be conscious of your general well-being whilst on the trip. Thankfully all hotels have hot showers and good food, so there is time to recuperate before the next day’s walk. Some first-time trekkers often struggle on the Tour du Mont Blanc as they have not trained in advance of coming on the trek. The TMB is not a place to get fit or find out that you are not fit. Interestingly, some of our fittest trekkers who have the greatest stamina are in their 60’s and 70’s and are very conscientious about training in advance. What some people regard as fit will be just a warm-up for others. There are very obvious differences between nations and continents on how people regard their own fitness. Whilst you may be regarded as fit amongst your friends, it does not necessarily mean you will be fit amongst your fellow trekkers. And, although some of the distances may not appear to be too long on some sections of the Tour du Mont Blanc, you have to consider the amount of ascent and descent you make. A climb of 3000 feet up and then down in one day is a lot. If you are only used to walking on relatively flat ground, you need to increase your fitness and muscle strength. In addition you may experience very hot weather or a heavy rain storm and this will drain your energy. Each day you should expect to walk for 6-8 hours and be outdoors 8-10 hours. Getting fit in advance of the trek will be key to enjoying yourself and staying safe in the mountains. You don’t need to be a super athlete to complete the Tour du Mont Blanc, but have a reasonable level of fitness before you go. Obviously walking is the best way to prepare – but one hour on the flat, three times a week is not enough. You need to walk at least 4-6 hours once a week, preferably on hilly terrain. You should also do some other low-to-mid intensity gym work or some jogging, cycling or swimming. Your stamina will increase over a few weeks and your cardio too. The best thing is to start getting fit at least three months – and preferably six months – in advance. Definitely don’t leave your training to the last month before you go on holiday and don’t over-do it either. Remember that you are training to go on a trekking holiday – not run a marathon in under three hours.